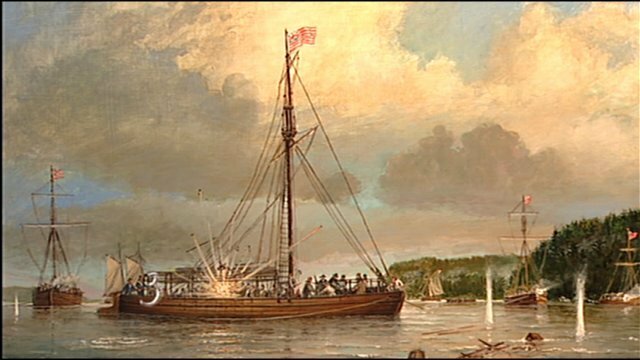 It may be Lake Champlain's best kept secret: a sunken Revolution War gunboat lying on the bottom of the lake for the past 231 years. Only a handful of people know where it's at. The boat is in one of the deepest parts of the lake, beyond the depths of most divers. "It fell as if it was still sailing," said Art Cohn with the Lake Champlain Maritime Museum. " We see artifacts showing in some places. We know there are dozens, hundreds, thousands of artifacts contained under the mud." The Spitfire was sunk by the British at the Battle of Valcour Island, one of eight identical boats that held off the British advance from Canada. "All of them were accounted for, either captured, sunk or burned, except for the Spitfire," said Rich Isenberg with the Maritime Museum.